If you haven’t watched Bong Joon-ho’s Netflix release Okja yet, then grab your remote or laptop and get ready for a heart-wrenching, action-packed journey into a fictitious super pig industry that looks a lot like meat industry reality. 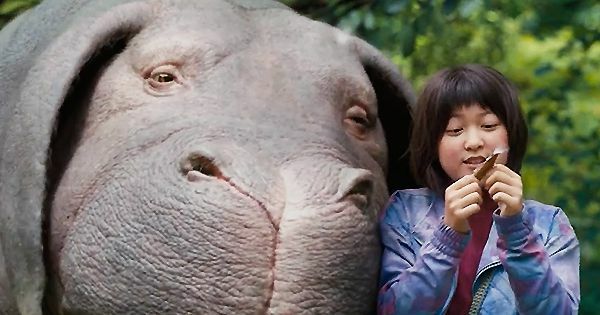 Okja, the title character, is a super pig, bred by the Mirando Corporation and sent to be raised on a sustainable farm in South Korea, where she grows up with Mija, a girl who loves Okja like family. Ten years pass and the Mirando Corporation wants their super pig back. Okja is a prime candidate to be the face of their super pig factory farm endeavor. After Mirando representatives cart Okja away, Mija will do anything to get her best friend back. It’s a familiar storyline reminiscent of many animal-companion kid-oriented movies. But this is not a film made for children and there is a stark, gritty reality that Okja explores. From the graphic animal cruelty to the marketing ploys that falsify and glamorize Mirando’s meat industry, this is a movie that highlights the worst truths about factory farms in a mythical tale about super pigs. A movie with a clear anti-factory farm message, Okja never fails to be really entertaining, too. With car chases, super pig snatching, and a peaceful yet militant animal rights group, the action is non-stop and the movie never drags. Okja is a film that challenges food consumerism, the factory farm model, and the often heartless way we treat animals. You'll fall in love with Okja, just as Mija does, and may end up rethinking your relationship with bacon.